Always innovating, Hunter Douglas has an extensive line of functional and beautiful products that can elevate the look of a room. At Treasure Coast Window Fashions serving West Palm Beach, we’re proud to carry the full line of Hunter Douglas products, including the new Sonnette™ Cellular Roller Shades, which can entirely transform a home. Read on to learn more! 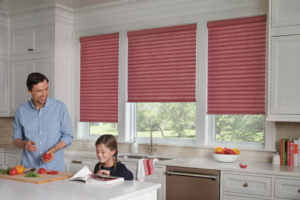 Entirely cord-free, which makes them child- and pet-safe, these shades are perfect for families. Combining the look of a roller shade with the energy efficiency of a cellular shade, these shades are stylish and sleek, and they control light in an amazing, innovative way. In fact, the construction of the Sonnette cellular roller shade is being called “the new shape of light.” These beautiful rolling cells gently diffuse sunlight throughout the room while creating a sense of privacy. Also offered is a room-darkening option that blocks the majority of incoming light to create the perfect environment for any room. This new hybrid shade sports rounded cellular construction that creates an energy-efficient layer at the window and offers a fresh contemporary look. The Sonnette shades come in four fashionable fabrics with 48 on-trend colors. Select from an array of subtle textures, vibrant shimmering fabric, fabric with a suede-like touch, or contemporary fabrics. The Sonnette cellular roller shade automatically comes with the new, battery-powered SoftTouch Motorization operating system, which is simple, intuitive, stylish, and user-friendly. Innovation drives Hunter Douglas by thinking of new ways to solve challenges through creating new and proprietary window coverings. Our Hunter Douglas window products add unique luxury and style to any room while also providing advanced solutions to everyday needs, such as managing light, insulating the window, child safety, sound absorption, motorization technology, and much more.